When Paul writes his second letter to his young protege, Timothy, he is in prison for the second time in Rome. The first imprisonment was five years earlier. Paul had used his Roman citizenship to appeal his arrest to Caesar and had been afforded a rather comfortable arrangement in which he was under house arrest in a rented house. He was released in 62 A.D. but was imprisoned again four years later. Now it was a completely different story. The political climate had radically changed. Two years after Paul’s release from his House Arrest in Rome, the city of Rome was destroyed by the Great Fire of Rome. The city burned for days and countless people were dead. Ten of the fourteen Roman districts were destroyed. Many accused Emporer Nero of setting the fire himself in order to clear land for his palatial complex. Rumor spread that Nero himself played his lyre and performed on stage, unconcerned, while the city burned. His approval ratings plummeted, and he did what all politicians do when they don’t want to face up to their own failings: find someone to attack and deflect the blame. In Nero’s case, he blamed Christians. Roman historians say that Nero fed Christians to wild dogs and crucified others. He also had Christian dipped into oil, then burned alive to provide light for his garden at night. 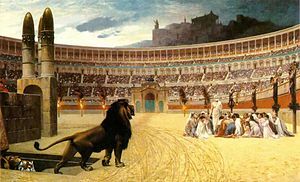 When Paul was imprisoned in Rome once again in 66 A.D., Nero’s persecution of Christians was well underway. The fact that Paul was a Roman citizen no longer provided political protection. Paul was an outspoken follower and proponent of Jesus, and that trumped the clout of citizenship as Rome daily tried to rebuild itself out of the ashes. There would be no comfortable house arrest. This time, Paul was thrown into a deep Roman dungeon to rot and suffer. Now read the verses above once more. Can you imagine why others were abandoning, Paul? He was a pariah. At best, anyone associated with Paul could likely face being thrown into the dungeon with Paul for being a fellow Christian. At worst, they could be put on the schedule to be a human candle in Nero’s garden. Paul is feeling lonely and abandoned. The only person who appeared willing to associate with Paul was Onesiphorus from Ephesus who sought Paul out in his dungeon on a trip to Rome. I found it interesting that Paul refers to “shame” multiple times in today’s chapter. He encourages Timothy not to be ashamed of following Jesus. Paul is not ashamed of his chains or suffering for his faith in Jesus, but he obviously feels the shame and abandonment of those he considered friends but abandoned him. He’s thankful that Onesiphorus was not ashamed of associating with him. Today, I’m thinking about the relative ease with which I can be a follower of Jesus. Yes, there are times of being unfairly labeled, misunderstood, and politically skewered. But seriously, some of that is the direct result of the foolish and misguided words, attitudes and actions of Christians themselves. I can easily forgive that and I’m not really suffering in any tangible way. When your life is on the line, it is a true test of what you really believe. What would I be willing to suffer and die for? Would I have been Hermogenes keeping a comfortable distance, or would I have been Onesiphorus throwing caution to the wind to visit and show a little love to Paul? I’d like to boast that I would be Onesiphorus, but in my heart I know that I have never been tested like that. My honest answer: I pray I would not be ashamed like Paul and Onesiphorus, but I confess that until my very life is on the line, I’m not sure I can say with certainty. I enter my day grateful to live in peace and freedom with blessing beyond measure.